Aldeburgh Suffolk, England, pictures, photos. 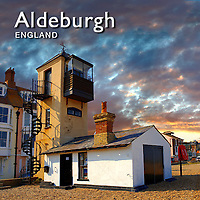 Images of Aldeburgh beach and seaside to buy on line as stock photos or photo art prints. Aldeburgh is a coastal town in Suffolk, East Anglia, England. Located on the River Alde, the town is notable for its Blue Flag shingle beach and fisherman huts where freshly caught fish are sold daily, and the Aldeburgh Yacht Club. The internationally renowned Aldeburgh Festival of arts, which takes place at nearby Snape Maltings, was created in 1948 by the resident and acclaimed composer Benjamin Britten.